Way back at the letter C is for Cooinda I made reference to a touring feature based there. 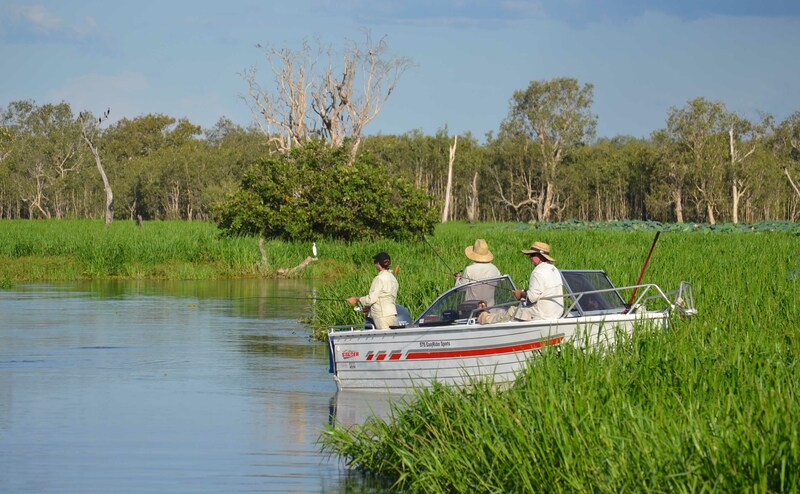 The Yellow Waters cruise is, for my money, one of the best things you can do in Kakadu National Park. 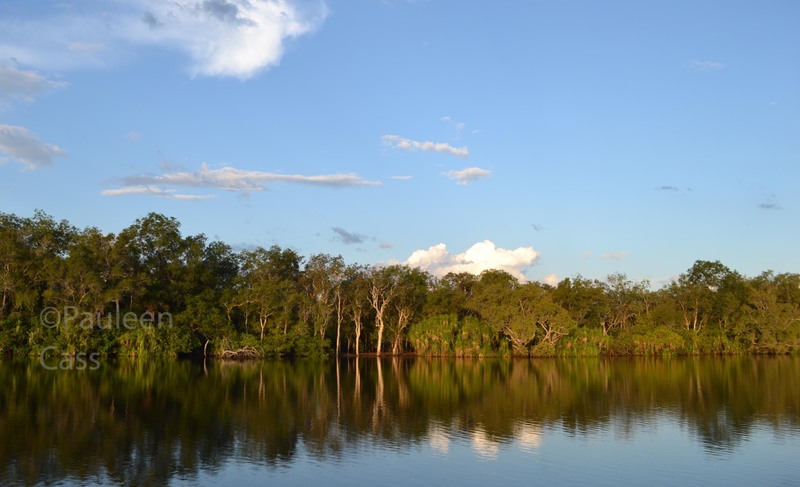 For bird watchers or croc seekers it has plenty on offer. For those who want to chill out just pottering along through the waterways it’s just perfect. 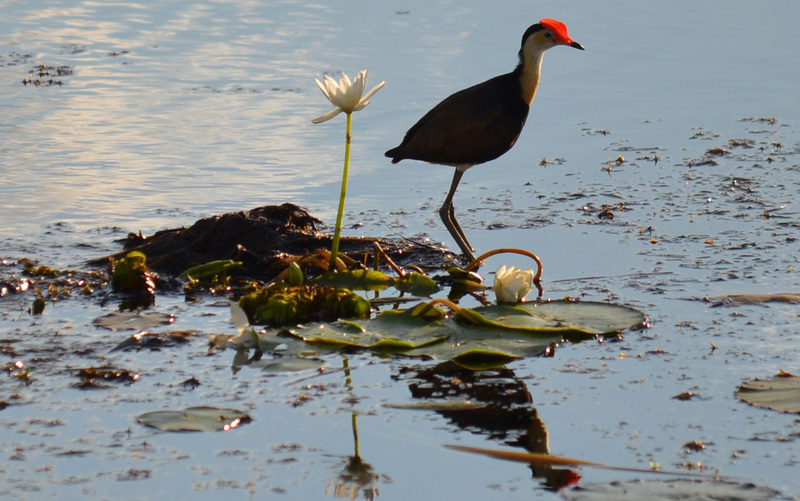 A jacana backlit by the sun. Whenever you visit you’re bound to see something different because nature doesn’t run to a schedule of activities: we’ve seen a croc take a large barramundi, brolgas dancing, jabiru, pelicans (occasionally), azure kingfishers, sea eagles and a steady avian diet of cormorants, night herons and jacanas. A tranquil scene on Yellow Waters. 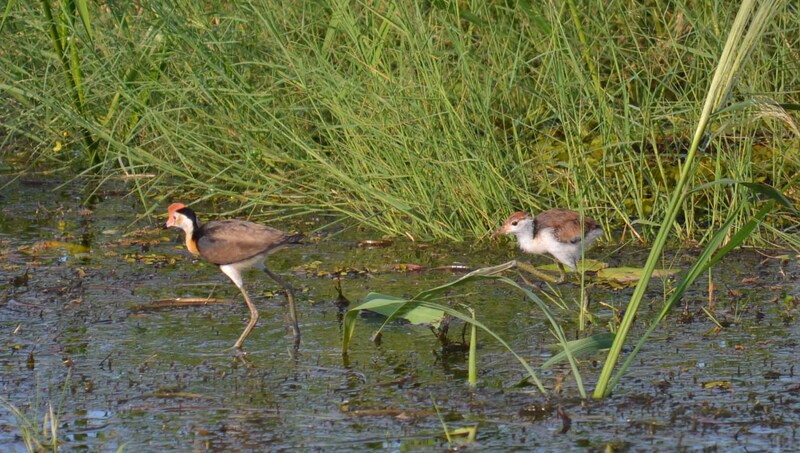 A male jacana and a chick. During the Wet Season the cruise is one of the activities that still continues but it is different because the water is so much higher, and with more water around, the birds are less desperate for places to hang out. 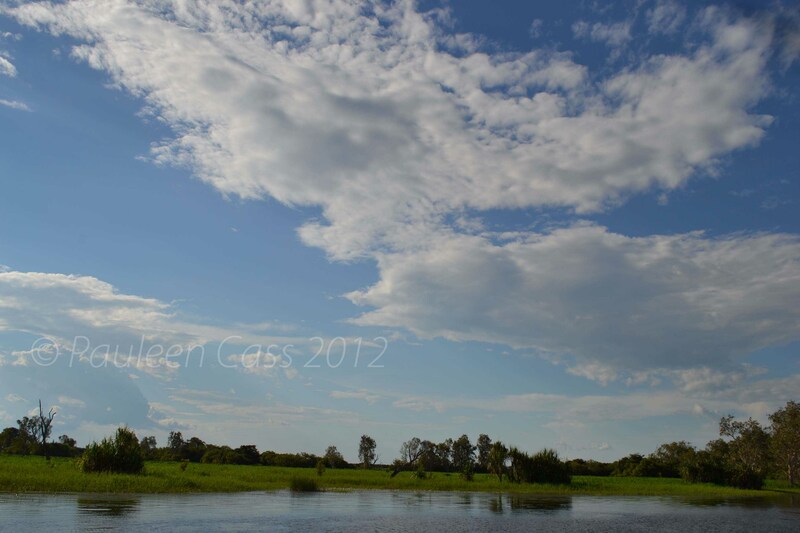 On the flip side you may see magnificent wet season clouds, all puffy and thunderous against the sky. 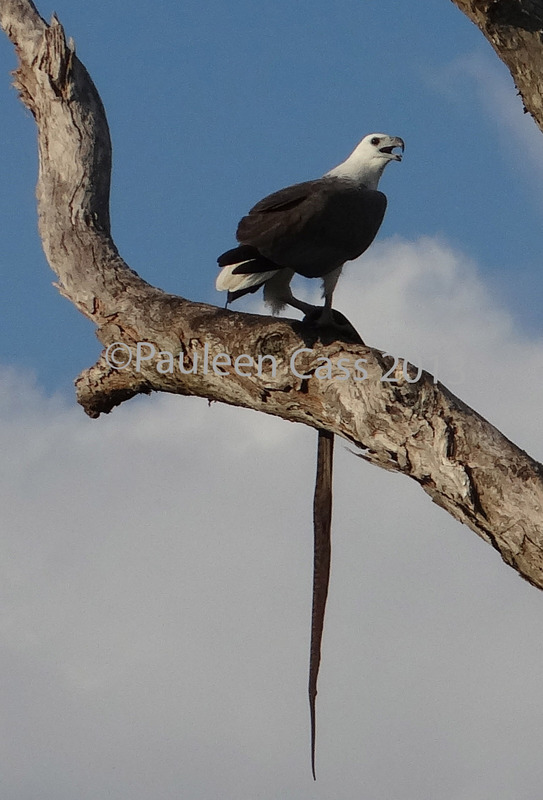 A sea eagle with his catch, a file snake. As you cruise through narrow channels into the larger billabong and waterways I sometimes feel like I’m on a secret pathway. It’s a rare trip when we haven’t seen something special and on a recent trip (the first we’ve done for a while) we saw a gorgeous rainbow, tiny jacana chicks and a sea eagle up a dead tree with his capture of a file snake (good tucker for all apparently). Is there a pot of gold at Yellow Waters? During the Dry Season the birds proliferate but then so do the tourists, but since you’ll be one you can hardly complain <smile>. The tour guides are very efficient and knowledgeable about the area. Our most recent guide (Mandy I think from memory) was the daughter of a traditional elder and she had lots to share with us. Some guides are more into birds, other into culture and Indigenous life, but all know that the average tourist is desperate to see a crocodile (count me out!). The locals enjoy throwing in a line when time permits. I was saddened to learn on the recent visit that the boats can no longer get down into the Melaleuca “swamp” where it was rather like being a serene yet spooky forest. 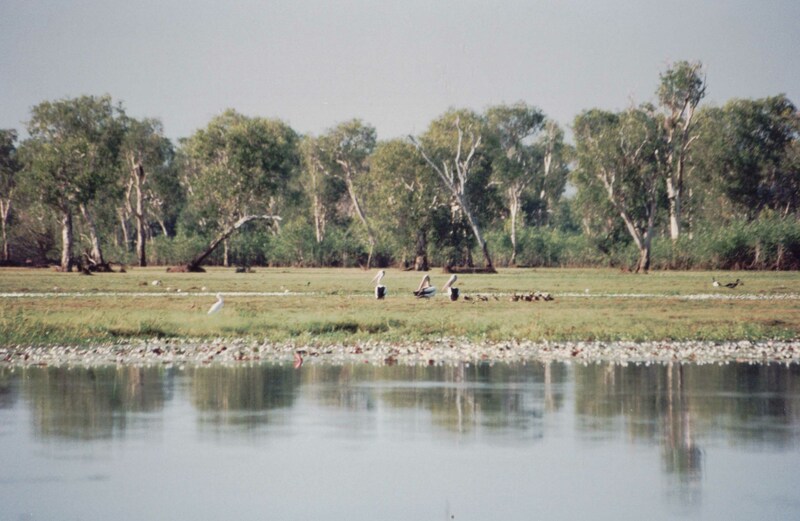 an old photo, probably the Dry Season, with pelicans, water lilies, ducks and herons. Everywhere you will see lotus flowers, water lilies and other flowering trees like some of the mangroves. What’s flowering again depends on the season. 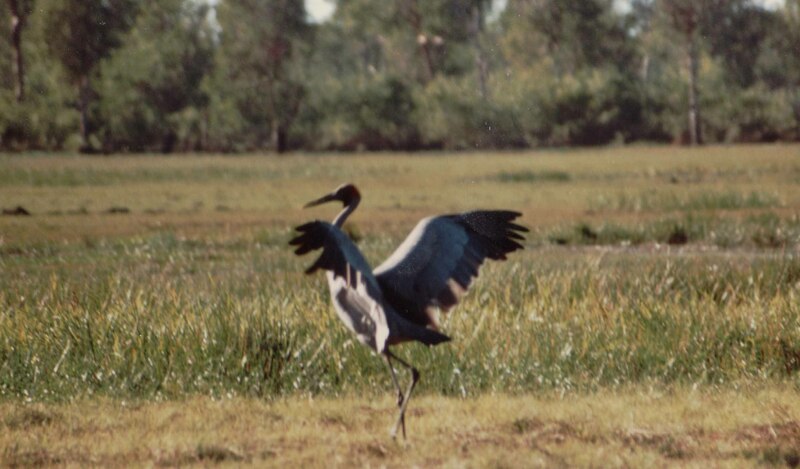 Trying to impress his mate, this brolga was right into the dance. 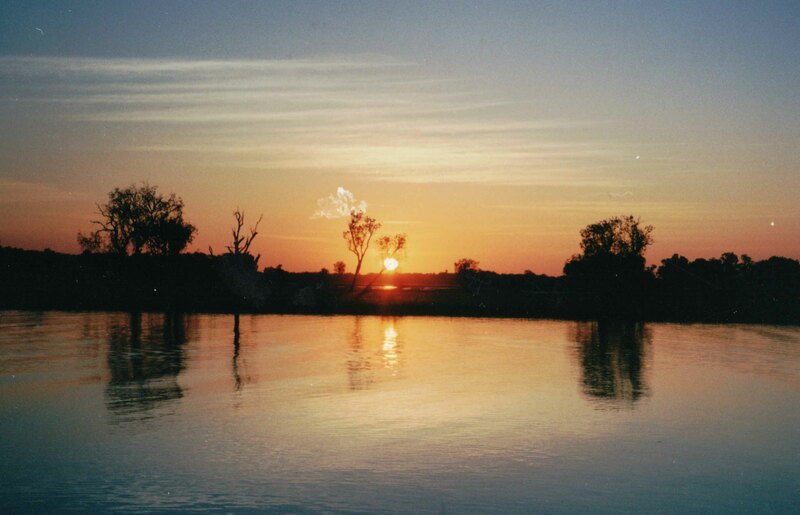 If you do travel to the Territory I hope you take this short voyage because it’s superb, and if you’re staying overnight at the lodge, perhaps book for the sunrise or sunset trip because you can either get a gorgeous sunrise through the mist which rises off the water in the Dry Season, or a blood orange sunset. A serene sunset over the water. Why visit: If you love nature, birds or just the serenity of being on the water. Coming on to the end of the afternoon, the colours and reflections were so pretty. 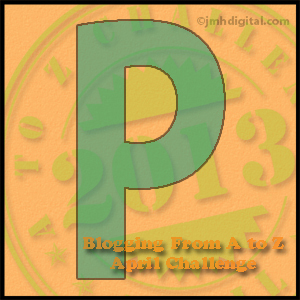 FYI: There’s are a couple of maps on my A to Z planning post which will help you to pinpoint where today’s tourist spots are situated. 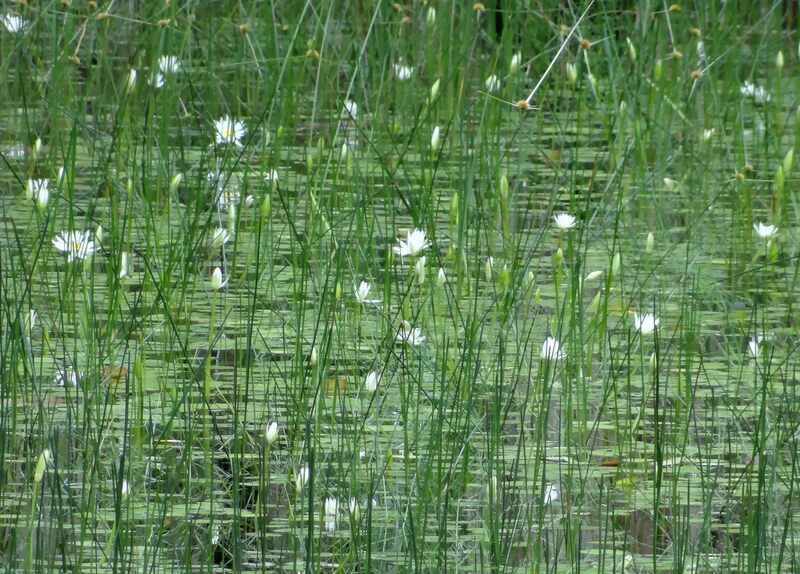 Snowflake water lilies look like something by Monet. Yakka: logically enough, hard work. Yobbo: a rough and ready person, rough around the edges, uncouth. 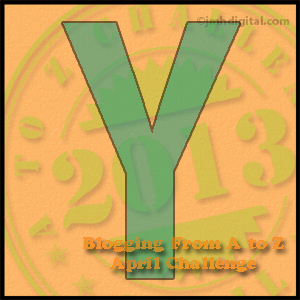 Y is for Yeehaa! 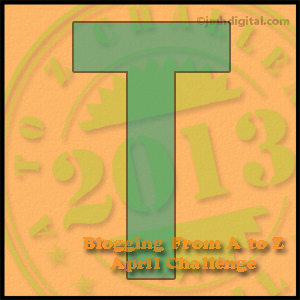 Only one more A to Z post to go! 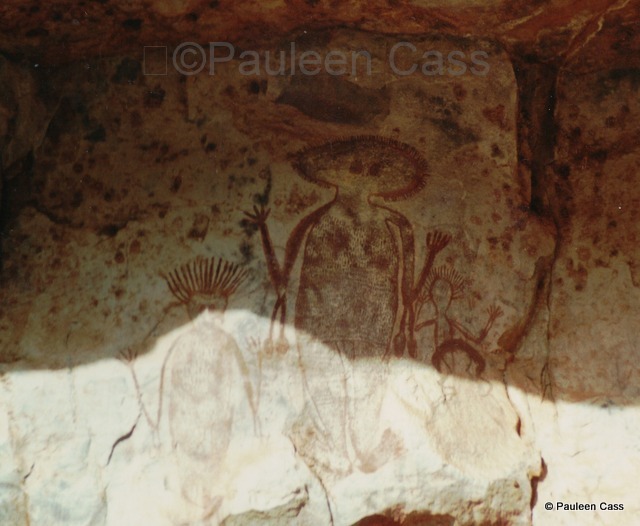 X-ray paintings are typical of the Aboriginal paintings which can be seen in the Wet Season caves and rock overhangs where the communities lived during the floods and heavy rains. The paintings span centuries and are frequently painted, layer over layer, by succeeding generations of artists. Some of the themes can be narrowed to particular time eg images of guns will only occur after the mid-19th century. Paintings of sailing ships may be more ambiguous as it’s known that the Macassan traders worked the northern coast of the Northern Territory. What’s interesting to me, is that these drawings aren’t by people who lived right beside the ocean, rather a little inland. Only specific people within the community who had the traditional responsibility could “touch up” the important paintings, which I believe was last done nearly 50 years ago. It’s interesting to me to look at photos taken back in 1991 when I first visited, with some taken last month. Paintings were a form of history keeping as well as telling cultural traditions and animals to hunt. Long necked turtles are still hunted in the billabongs in Kakadu. I’m not going to try to explain the intricacies of the X Ray Paintings as I’m no expert. There’s an article here by the Museum of Modern Art in New York. 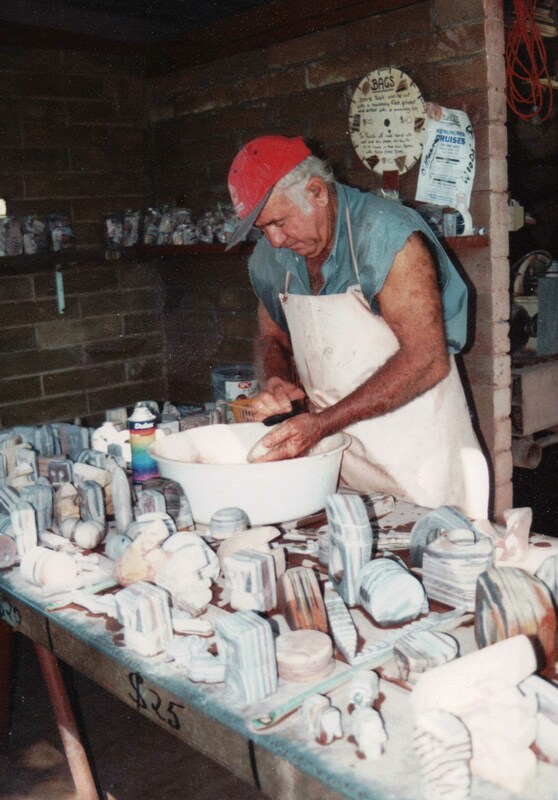 The style of painting is still reflected in some art work by Arnhem Land artists. A hunting scene shows men with spears. The Aboriginal people were, and still are, excellent hunters in their tradiitonal land. You can see people, fish and a turtle. 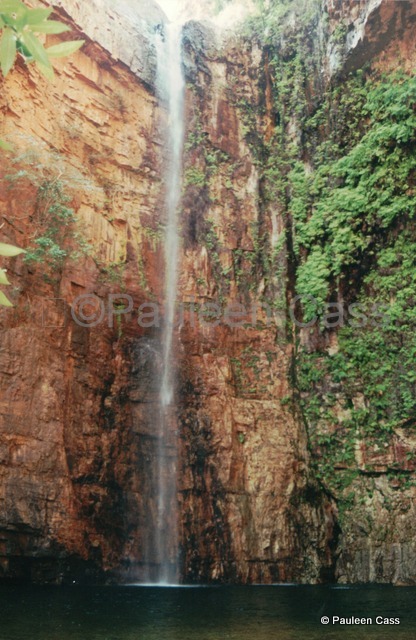 My photographs are taken at two sites, both in Kakadu National Park. 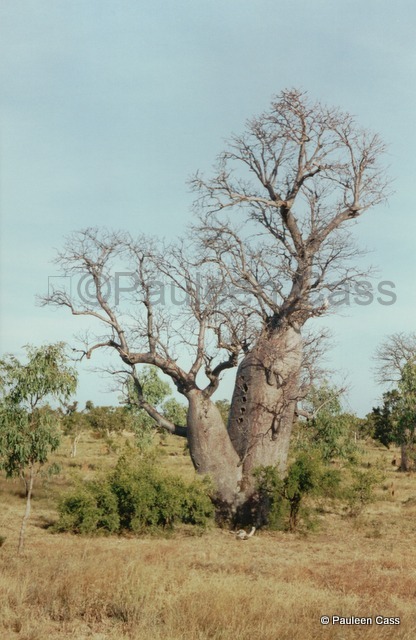 One is Ubirr and the other is Nourlangie (or Burrunggui). There are a couple of galleries in each place, and it’s well worth visiting each. Do take time to sit down and have a breather and a sip of water. The longer you look, the more pictures you’ll see. At Nourlangie’s Anbangbang gallery, the iconic image of Namarrgon, the Lightning Man is the most popular feature. Anbangbang gallery hosts these amazing paintings including the LIghtning Man with the arc between his arms. Archeologists have dated Nourlangie’s Anbangbang gallery as having been in use for over 20,000 years. So much for Australia being a young country! The person on the left is without a doubt, a white man. The image on the left has a Wandjina vibe to me but I could very well be wrong. Why visit: to see ancient art tell a story of life before white settlement, and stories of traditional culture and hunting. The closer we get to the end of the alphabet, the fewer options for Aussie-isms, perhaps we really are lazy after all! XXXX: Fourex beer is manufactured on Milton Rd in Brisbane, close to the famous Lang Park Rugby League grounds. XXXX is a Qld icon! Once again we’re off to the Red Centre today, right to the cultural, geographic and iconic heart of Australia, Uluru or Ayers Rock as it used to be known. The colours of the desert and the Red Centre. I can’t imagine there’d be too many of my readers who won’t have seen an image of this monolith either in a TV show or in a book. Perhaps you might think that, like the EiffelTower or the Leaning Tower of Pisa, you’ve seen it so often “virtually” that’s there’s little point in actually visiting. You expect that you’ll arrive and think “oh, yes, that’s what it’s supposed to look like”. We were surprised when we visited Uluru on a long road trip from Brisbane via Adelaide, that it actually took our breath away. Like many we were initially fooled by Mt Connor with its look-alike appearance, but when you see the real thing, you’re in no doubt. I had no difficulty believing the Aboriginal sense of its religious significance. It may seem strange to say that a large lump of rock has an aura, but we found that it did. There is just something about it that holds you in thrall. Perhaps all those centuries of humans around it have imparted some human spirit as well. Hidden nooks, crannies and eco-systems. I have a fear of heights so had no inclination whatsoever to climb the rock and was happy to abide by the local Aboriginal people’s request not to do so. Our two then-teenaged daughters did go to the top and took their time steadily getting there. I doubt that having lived in the Territory for so long now that they’d ever climb it again. Huge variations in the rock face add interest and mystery. Apart from the cultural prohibitions, there are practical reasons not to climb. It’s far from uncommon for people to die high up the rock from exertion, heat stroke or whatever. This means that the poor emergency service workers have to put their own lives at risk to get someone down. Sunset over Uluru with a view to Kata Tjuta. There are alternative activities which will give you a much better sense of the place and my favourite was walking around the base looking at the colonies of plants and animals and seeing the impact of the heavy rains. I only wish we’d been there when it rained! If you’re there and it pours, don’t bemoan your fate, dash out with your camera and get some amazing photos. Check out this story about how a local photographer captured Uluru in a downpour. I’d give my eye teeth to see it running with rain like this and I was green as a shamrock when some of my work colleagues fluked exactly that. The finger-like detail of the rock face. We have some special memories of our camping stay at nearby Yulara. The ice on the water bucket in the morning (it was sub-zero) and the sound of our daughters tossing and turning under their heat blanket (they forgot their parkas when they left home to catch the plane to meet us). The sounds of the didgeridoo and singing from a corroboree nearby, and the howl of the dingoes. 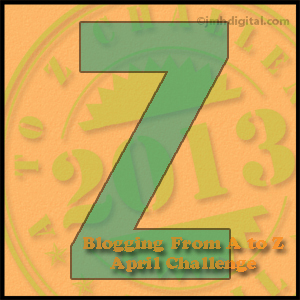 One of the things this A to Z has done for me, is remind me how many places we need to revisit ourselves. Why visit: to see Australia’s red heart and an iconic site. To learn more about Indigenous culture and life in the desert. Rellie Run: the compulsory visit to the family interstate, very common in a place with many transient residents and where few have deep roots in the state. Hard to believe we’re now a three generation Territory family….where did the years go. 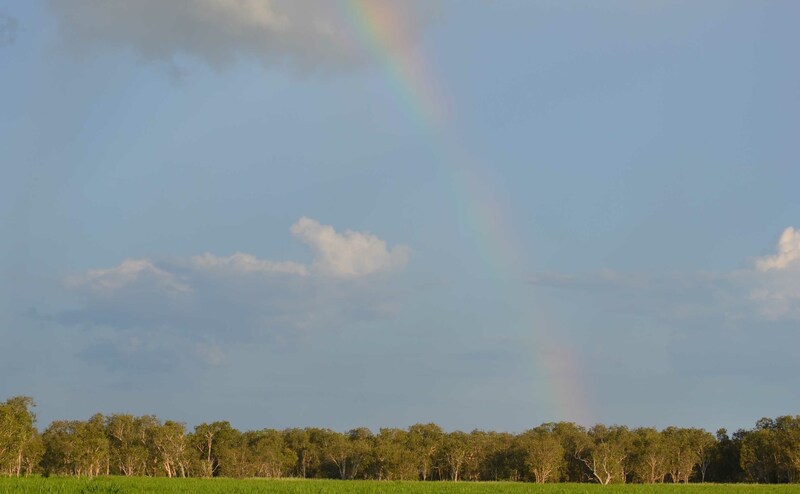 Over the past few weeks we’ve been focused on the far north of Australia, especially the Northern Territory and the Kimberley in Western Australia. This part of the country experiences heavy rains during the summer months (usually December-March) and almost completely dry weather in the Dry (May-August). For the Wet months of the year the country looks fresh and green and lush, but come the drier months, it quickly becomes steadily browner. 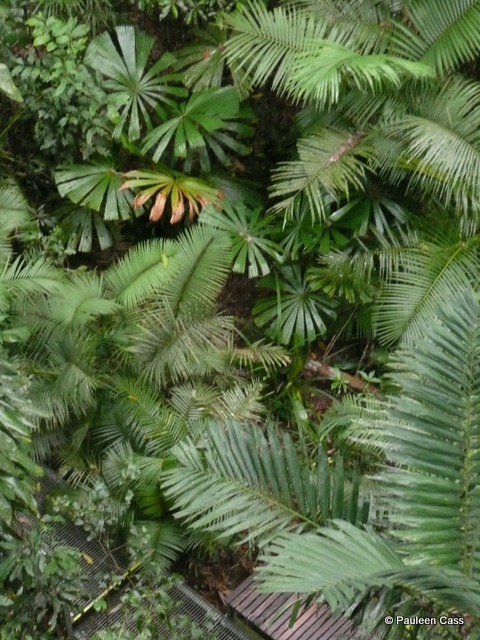 For all the rain, you aren’t seeing tropical rainforest, rather tropical savannahs. 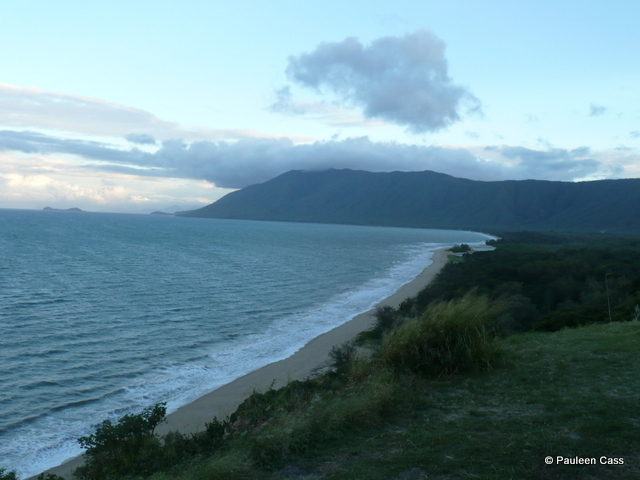 Over on the eastern coast in far north Queensland (FNQ), the story is different, especially north of Cairns where we’ll be heading today. 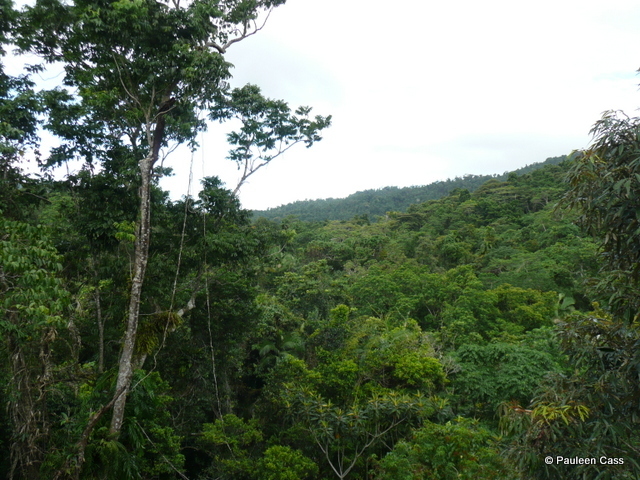 This is tropical rainforest, lush, green and thick vegetation, one of 200 globally important eco-regions. The Daintree is a world-renowned touring location for Wet Tropics and with fewer and fewer rainforests world-wide is extremely important. What this means for the tourist is a completely different experience of scenery, flora and fauna. While many world travellers come to see the Barrier Reef, the tropical rainforests are a great complement to that adventure. The green of the jungle runs down to the water’s edge merging with shades of blue and turquoise, interspersed only by sandy beaches. You don’t really need to do a tour of the area, unless you feel you really want to. A normal hire car will get you to most of the important places, but do make sure not to wander into the 4WD area only! There are lots of places you can explore without the 4WD vehicle. The Daintree Discovery Centre with its aerial walkways and boardwalks is amazing, with a wealth of information about the wildlife which live in the rainforest and the plants that grow there. If you’re into nature you will inevitably need more time than you think. Check out the web link just to get a preliminary insight. Cape Tribulation is a tranquil spot where the rainforest really does meet the sea. While you’re nearby a trip to the tropical fruit farm is an eye-opener. If you get a chance do try an ice cream made from the unusual tropical fruits. 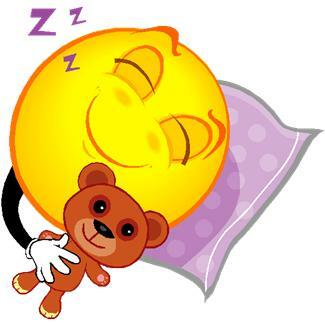 Or spend a night or two just relaxing in the area and communing with nature. There are some very glamorous places to stay. Where the rainforest meets the reef nearing dusk. 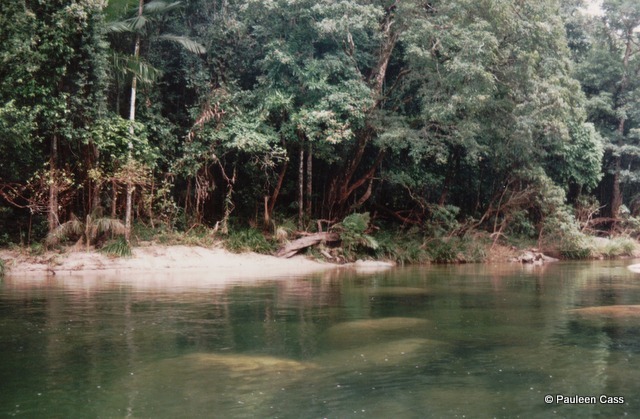 We visited Mossman Gorge quite a number of years ago and just loved the sight of the river running over the huge boulders. We had afternoon tea overlooking the river –just delightful. This area has a strong Aboriginal heritage too and there’s quite a lot of opportunities for travellers to learn more about Indigenous culture. 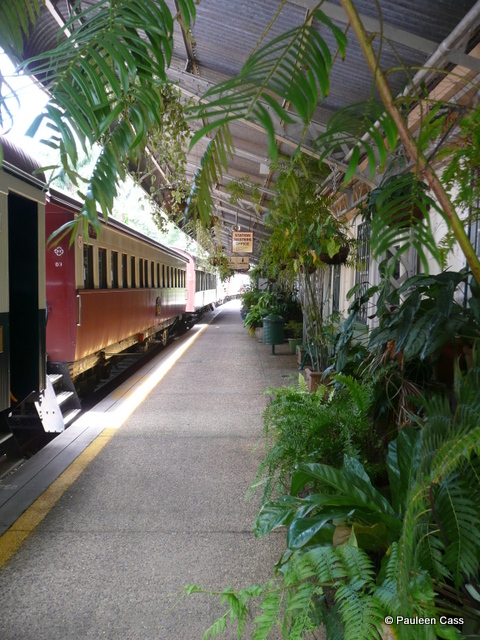 Take a steam train trip on the Kuranda scenic railway. Closer to Cairns you can also see the rainforest by taking the Skyrail up to the ranges then perhaps coming back down via the Kuranda steam train, a fun adventure for all ages. 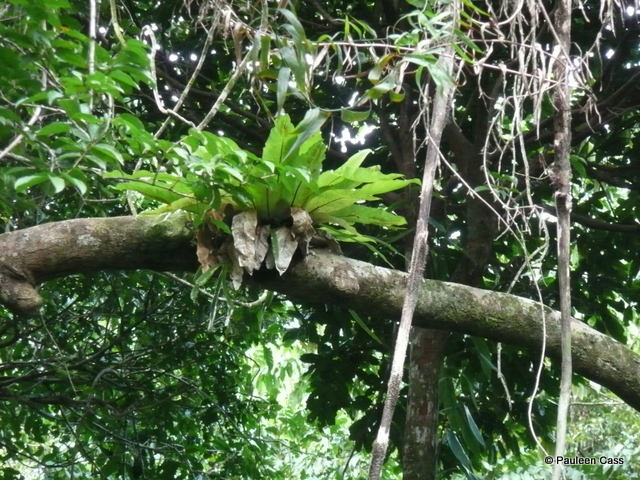 Why visit: to see one of the world’s great rainforest areas, to experience nature and see the flora and fauna. Enjoy the contrast between the sea, the sky and the sand. 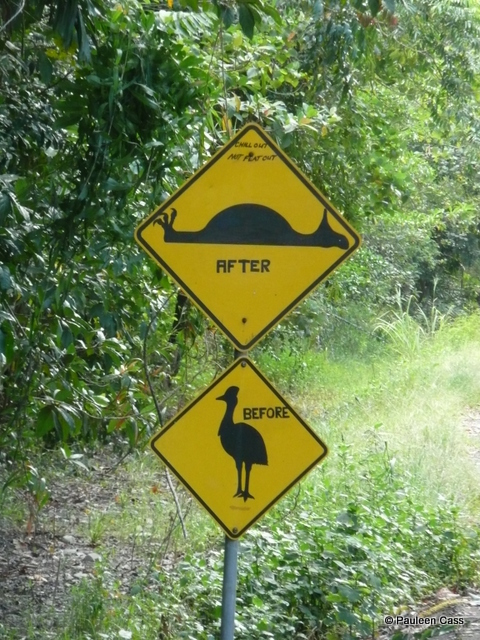 A humorous take on avoiding cassowaries. 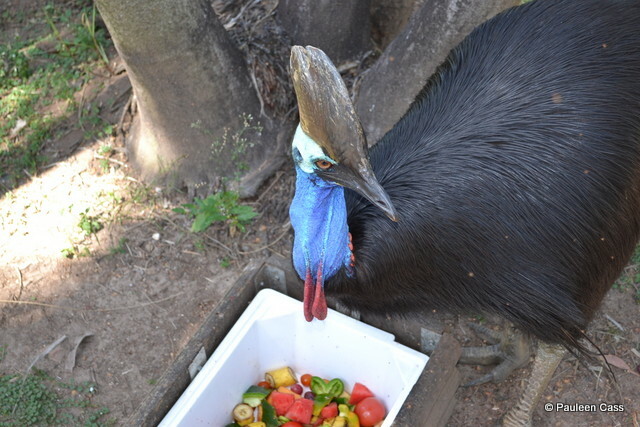 A cassowary at Crocodylus Park, Darwin. These birds with vicious claws are native to the Daintree. Tinnie: this can be a beer can or a small aluminium boat for fishing. Too easy: Another new one which is in common use by Territory tradies. It’s the equivalent of “no worries” or “no problems”. Togs: this is the Queensland name for a swimsuit –one of the words which differentiates people from different states. Thongs: rubber scuffs for your feet, as well as more recently the rather brief ladies’ underwear. Australians do love to stir visitors with the threat of its slithery, snapping, stinging, stabbing venomous critters. You might even say it’s a national hobby. Yes, we also have those cuddly koalas and cute kangaroos but it’s the surreptitious creatures that strike fear into many hearts, visitors and locals alike. Add that to an Aussie’s love of the beach and you’ve got a very unfortunate combination, especially in Australia’s Far North where there’s even more of them, or as one daughter once said “I’m going where there are fewer creatures to kill me“: she’d had enough of stingers, salties and king brown snakes! But the Territory was under her skin and she came back. Now that we’re up to the letter S, you’ve seen a lot of gorgeous places that you might want to add to your Bucket List. Today’s post is the warning notice that comes with your booking….you know, the contract’s small print. You’ll soon realise why so many of us prefer the pool to the beach if we live above the Tropic of Capricorn. So what have you got to be afraid aware of? Apart from the length of this post, that is. 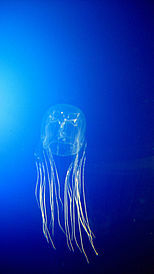 A box jellyfish. Image from Wikipedia. These are the party poopers of the natural world of our Tropical zone…you look out at those magnificent blue seas but swimming is hazardous. Apparently stingers are also literate because they only hang around in the months with an R in the name (September to April). We’re not talking blue bottles here, even though those can deliver a nasty sting to be remedied with your mother’s old blue bag from the washing. The box jellyfish of the tropical waters can/may kill you or, at a minimum, deliver an incredibly painful sting. Deaths may be rare but I know personally of at least one case where a small child died. Vinegar over the sting helps, but not going in the water helps even more. Some beaches on the north east coast of Queensland are protected with stinger nets, but unfortunately the Top End of the NT and WA have such tidal extremes that nets are impossible. 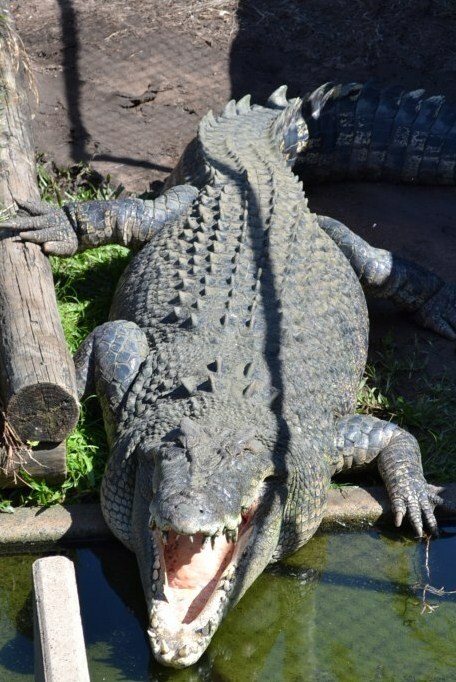 I snapped this croc at Crocodylus Park. You get the picture! Saltwater crocs abound in our waterways, especially since culling became illegal. 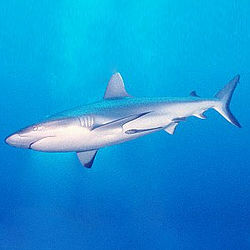 All river systems, the ocean and many billabongs provide them with a lovely home and food source. They’re there and they’re dangerous…seriously dangerous. The local rag newspaper keeps track of how many are removed from Darwin Harbour each year: we’re already up to 59 this year….and that’s just the ones they’ve trapped. Visitors to town can visit Crocosaurus Cove where you get an example of the fierceness and strength of their jaws –their “snap factor”. Where else might one’s small grandchildren automatically ask if there are crocs in a waterway and know that crocs will take their prey in a death roll underwater before stashing it under a log? And if you’re camping make sure you’re not too close to a waterway unless you fancy being “human en croute” for Mr or Ms Croc. If you’ve visiting Darwin, do add the Museum to your touring list. It’s an excellent tourist venue and you can see all these scary creatures safely preserved where they can’t hurt you! A popular feature is Sweetheart the saltwater croc which has an interesting story. (Have a coffee or lunch or smoko in the Cornucopia Cafe while you’re there and enjoy the great view of the Sea). A king brown or mulga snake, common around the Top End. Image from Wikipedia. Australia apparently has more venomous snakes than anywhere else in the world (too far for St Patrick to get here it seems!). 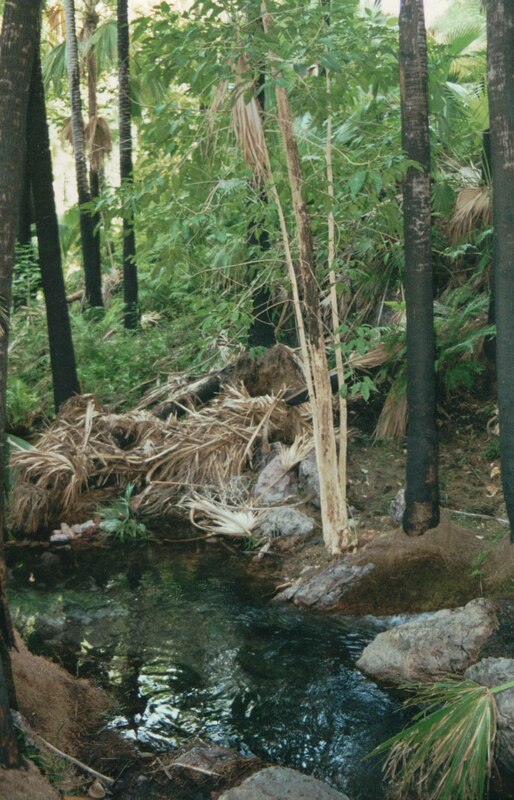 I grew up around a fair few snakes because we lived near a creek with natural bush. I have great respect, and a high degree of loathing, for them. My Dad’s advice was always to stand very still for a short while, then ever so slowly walk backwards for a way. My addition was “then run like hell”. This training proved very helpful one day at the beach when I found myself, in bare feet, less than a foot from a mercifully snoozy death adder. Mind you, I didn’t much like all my fellow wood-collectors screaming and shrieking at the same time. When walking in the bush it certainly pays to keep your eyes peeled (and wear shoes!) as a sunning-itself snake can look remarkably like a fallen branch. Not to mention there are some cracker water snakes, all of which are venomous if the museum is to be believed. Mercifully there are a lot of anti-venenes available for the most prevalent snakes. The other scary water creature is the shark which is certainly out there in the tropical waters but takes a lower profile thanks to the stingers and salties. Further south, where they’re the main water hazard they have a well deserved reputation for dangerous attacks. Perth seems especially vulnerable. Coastal Queensland has some shark nets out past the surf which are monitored. Did you think I’d finished with scaring you? 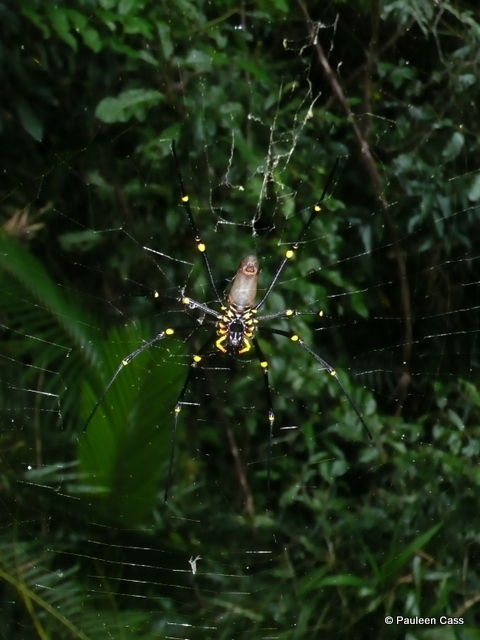 We have more than our share of poisonous Spiders but really they tend to be played down in the larger scheme of things. Not to say they’re not potentially dangerous! 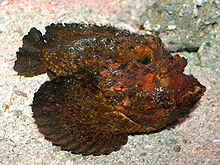 A stonefish in an aquarium is far more obvious than in the natural world. Image from Wikipedia. I love collecting Shells but even these have life-threatening potential. In my pre-ecologically-aware youth I used to collect shells from the reef at Magnetic Island. Cone shells have a barb that shoots out if you pick them up so you need to learn the correct way to do so (with the narrow end facing away). Stonefish are another hazard of tropical waters and especially around Queensland’s north. They’re the ugliest creatures you might see and extremely difficult to spot at low tide huddled in the dark sand or mud. Stand on one and you’ll know all about it! Hence why wearing shoes is wise when roaming the reef at low tide. Scared yet? How about some gardening? 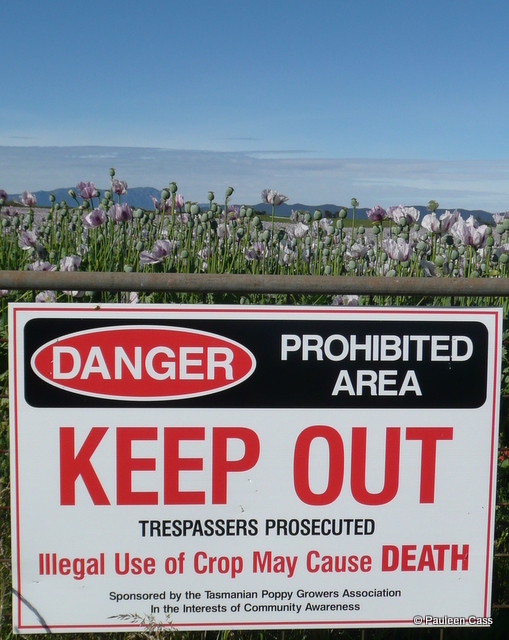 Perhaps all these hazards of the natural world have frightened you off and you think a nice safe spot of gardening will do the trick. Well no, because during the Wet Season there’s another hazard: Nightcliff Gardening Disease (after a Darwin suburb) is its common name but more correctly it’s Melioidosis. Most people aren’t susceptible but those with poor immunity or perhaps diabetes are at risk of infection and subsequently amputation or even death. My original plan had been to talk about the Stuart Highway, aka The Track, which runs from Darwin south to Alice Springs then Adelaide. 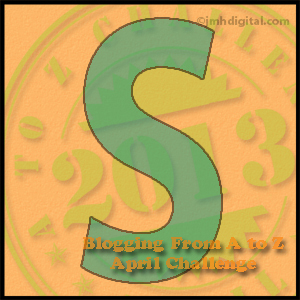 However, I decided to make S a more fun post and I’ll share the important history of the Track after the A to Z is finished. If you want to see where it is, and just how pivotal it is to touring the Territory: you can see the highway represented by a steady stream of yellow flags. Why visit: For all that these risks are real, plainly they’re also not statistically high or Australia would have an even smaller population! It’s all a matter of common Sense and taking appropriate precautions. Surely all those wonderful Sights and Scenery outweigh a few risks. 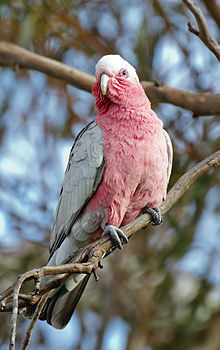 A galah. Image from Wikipedia. Shrapnel: small coins/change (I’ve got so much shrapnel in my purse my handbag is heavy). Station: This is an important one! In this context it’s a large property for grazing animals. These are NOT called ranches in Australia. Stockman: a person who works on a station rounding up cattle etc. Sanger short of a picnic: a bit mad or crazy, not “all there”. Scab: someone who works when other staff are on strike. This is a mega-insult. Alternatively “can I scab a few dollars off you” means “borrow”. Join me Tomorrow as we Tarry in the Tropics. One of our regular overnight stops on the long drive to Brisbane is Renner Springs, especially when we set out from here later than intended. 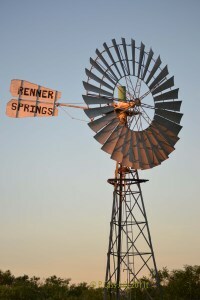 On the face of it, Renner Springs appears to be a pretty boring road stop with not much to recommend it but pop over to my post about the surprising things you might see if you wander around a bit, or if you’re up early. 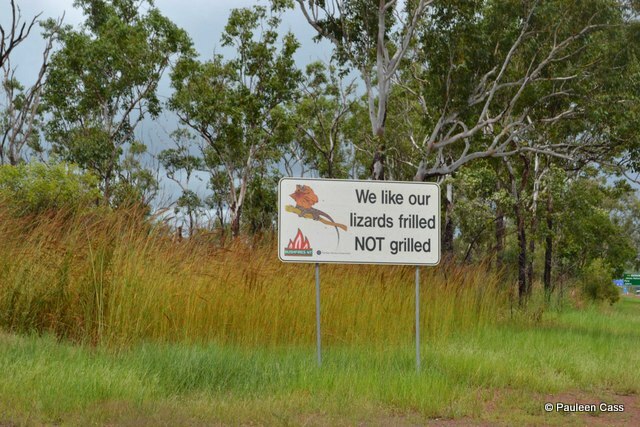 Since we’re on the road I thought today we’d have a chilled-out kind of R day and check out some of the weird and wonderful signs we’ve seen on those long-distance drives. Just to set the scene I want to show you an image to capture just how vast our distances are as I’ve mentioned previously. 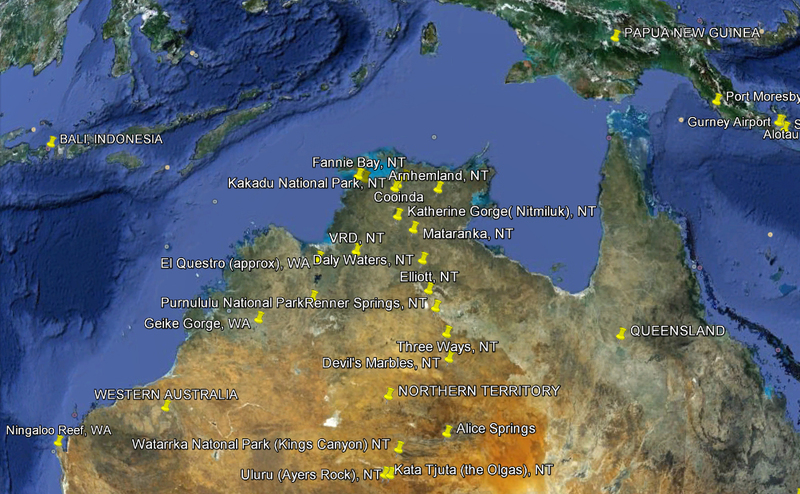 Darwin is about equidistant to Brisbane on the east coast or Adelaide in the south, roughly 3300kms. I took this photo a few years ago on the coast of Ireland. Moscow anyone? Yes we are a long way away from “anywhere”. The roads of the north are regularly sprinkled with road trains. They’re BIG and very daunting. With the prime mover and three or four trailers they can be up to 50 metres in length and be travelling at around 100kph. Fortunately the drivers are generally responsible but it can take a long time to pass one of these even at the legal open-road limit of 130kph. So this is how to deal with them. I always have my heart in my mouth when I have to overtake one. The large frill neck lizard is a feature of the Top End, as are Dry Season fires. 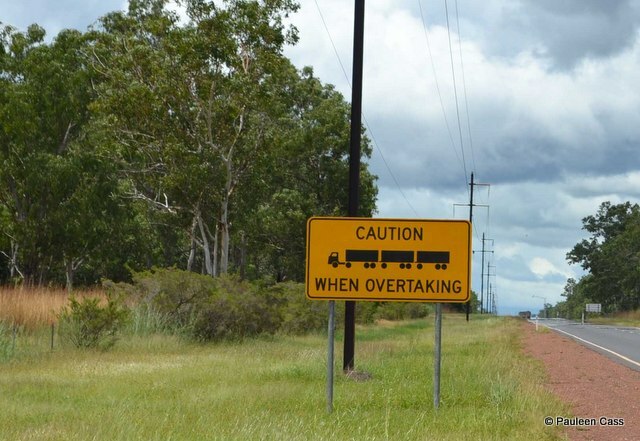 This road sign was at Mataranka, about 4 hrs south of Darwin. 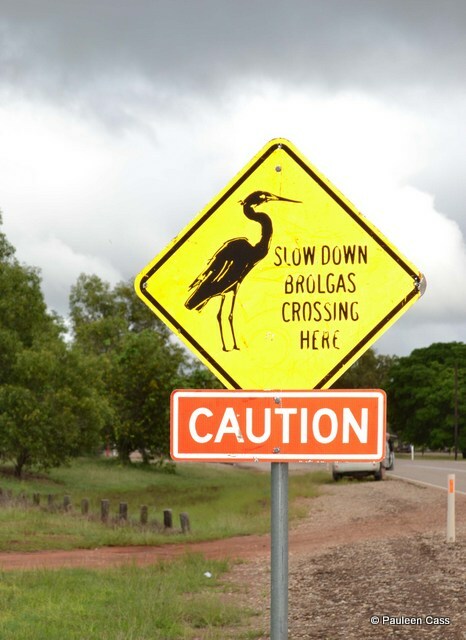 Not that I’ve seen brolgas there. 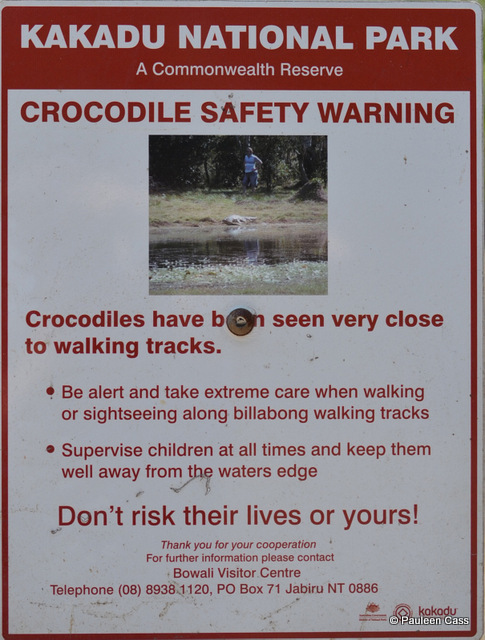 There are crocodile warning signs on most of the waterways in the Top End -with good reason -this is just one example. Do take them seriously…this is not a “beat up”: people and animals can and do get taken by crocs…not many live to tell the tale. And if anyone can explain what a rhinoceros has to do with the Northern Territory I’d be happy to learn. 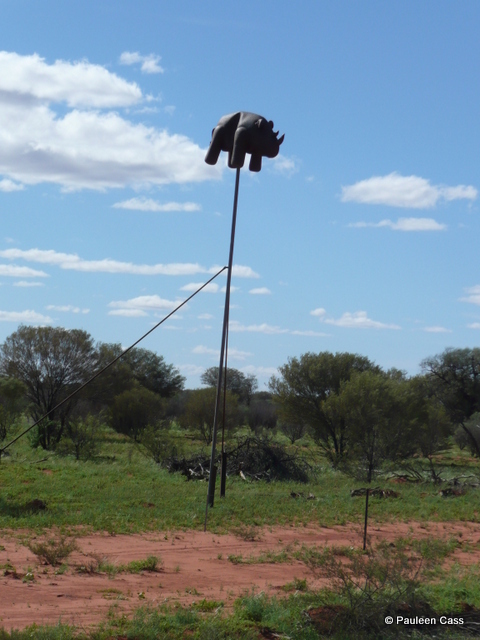 We saw this on the way to Alice Springs one year. 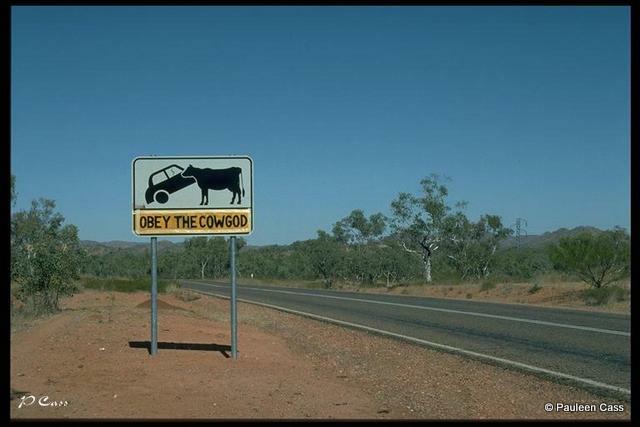 This edited road sign on a Queensland road was a humorous warning of the hazards of cattle on the road. A innovative response to marketing – start advertising at a distance! Only 2000kms and another State away. Ripper beauty: Excellent, great idea etc. Or just “ripper” on its own. Ratbag: another insult, generally mild and may even be somewhat admiring when it’s implying cheeky and the like. Ring-in: someone or something that doesn’t belong, an extra on an outing. I’ve brought along a ring-in, hope that’s okay. Dead ringer: a look-alike eg she’s a dead ringer for ….name your famous person. Or she’s a dead ringer of her mother at that age. Reckon: estimate of cost or an opinion. I reckon he’s bitten off more than he can chew this time OR I reckon it would be worth a hundred bucks. Rip off: when the cost of the item is more than it’s worth. Ridgey didge: True blue, fair dinkum, honest, the real thing, the genuine article. Ranch: Australians do NOT have ranches!!! 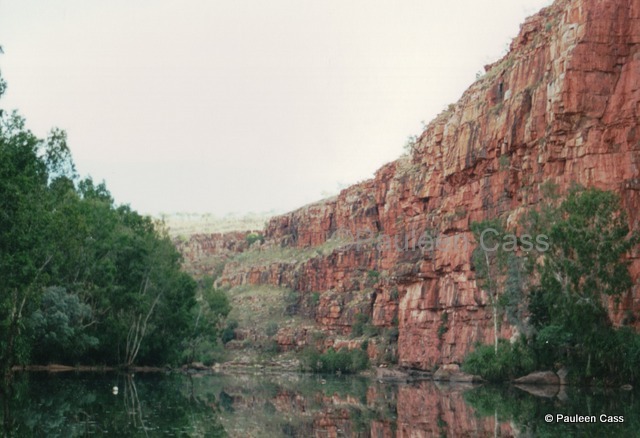 Once again today’s trip takes us across the NT-WA border into the magnificent Kimberley area. 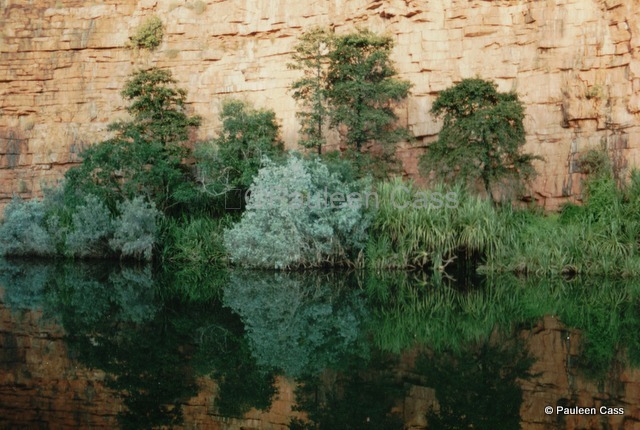 El Questro Wilderness Park lies in the north-east of the Kimberley’s 421,000 square kilometres of natural wonderland. The property is perhaps more well-known for its high-end luxury accommodation in the homestead, but that shouldn’t deter those of us with less well-lined pockets as there are other options for staying here. When we visited back in 2001 we chose to stay in the secluded camping spots alongside the PentecostRiver, which have no facilities, rather than the busier camp site nearer to the Station. It was blissful to be just relaxing in the midst of the bush listening to the birds, rather than other campers. It’s not as if you’re miles from anywhere as it’s a short drive, or longer walk, to the shop near the campground. Why didn’t we take a photo of our campsite I’d like to know?! Apart from the two camping areas, the more upmarket bungalows, and the lodge, there are also the safari-style tents at Emma Gorge, closer to the entry to the property. Even if you’re not staying there you can go into the restaurant/bar area and have a “coldie” either before or after your walk into the gorge. Although you may be tempted to do a lot of chilling-out (not always easy in the 30+C heat! ), there are plenty of activities you can organise through the Station. We chose to do the Chamberlain Gorge boat cruise and absolutely loved it. 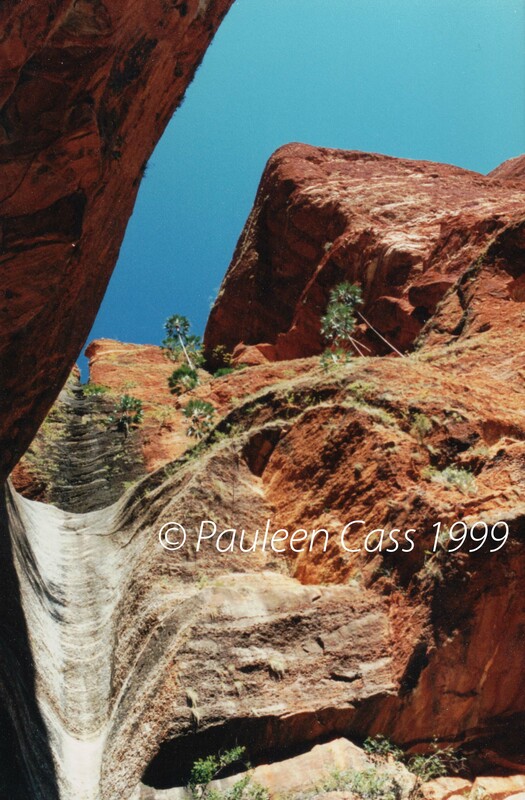 The scenery is magnificent, once again with the landmark red cliffs and fresh water. Of course the colour of the rocks changes with the time of day and when the sun is angled on it. 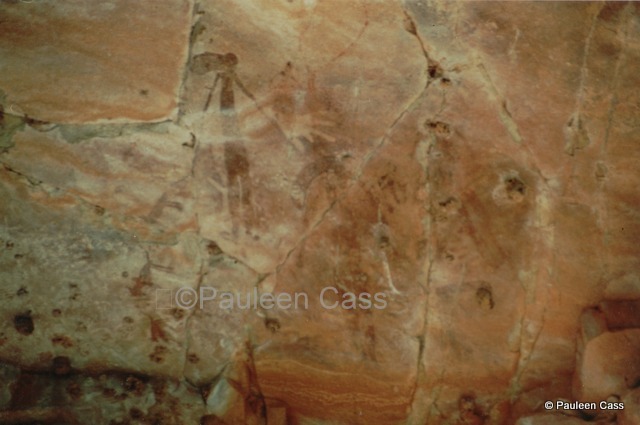 Look closely and you will see the “Bradshaw” paintings of people, a hand print and a kangaroo. All on the cliff face protected by overhangs. The guide will also show you some of the ancient Aboriginal art that’s tucked away among the cliffs, overhangs and mini-caves. It is such a privilege to see this art that dates back thousands of years, perhaps as much as 20,000 years. 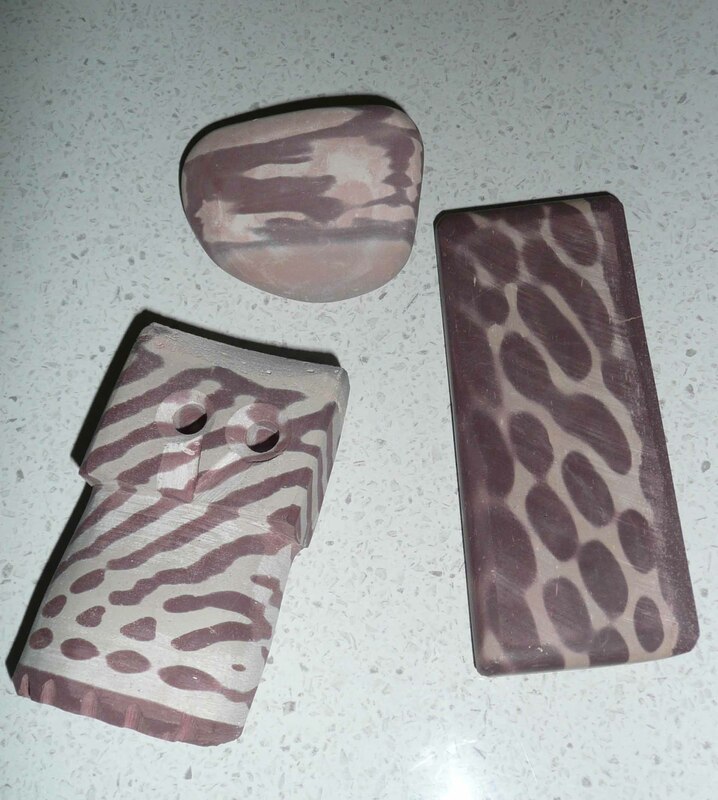 The Wandjina paintings are just beautiful I think and a nice souvenir is to buy a pair of stirling silver earrings in those shapes from a jewellers in Kununura. If you want to know more about the facilities and touring options you can check out their e-brochure, and sadly I’m not getting any kick-backs on this promo. But I am reminded that it’s far too long since we visited ourselves, though it will be tents once again for us. The other really important thing you need to know is there is no access during the northern Wet Season (about December-March or April), so you need to keep this in mind. Similarly what sort of vehicle you’re driving will determine how early in the open season you can drive in, as the river may still be impassable in a sedan (especially a hire car!!). And if you want to know what it’s like staying at the homestead you can check out this post by the couple we met recently in Papua New Guinea. Okay I’m not going to talk about Queensland here except to say the northern half of the state sits in the same latitudes as the other places we’ve been talking about. 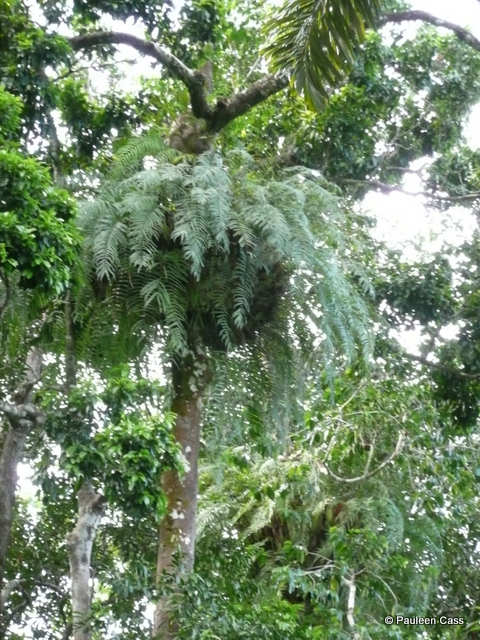 Some of the scenery may be similar but east of the Great Dividing Range you hit the Wet Tropics. More on that anon. How could I not mention my home state under Q? 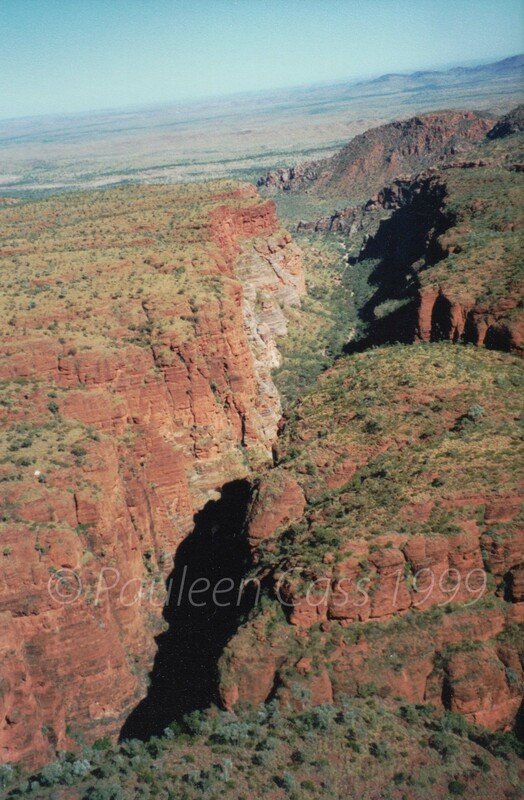 Why visit: For yet more magnificent outback scenery, to see ancient Aboriginal art and just to have fun. FYI: Don’t forget to check out where these places are on the maps on my A to Z planning post which will help you to pinpoint where today’s tourist spots are situated. Quid: a pound in the old money pre–decimal currency on 14 February 1966 (a jingle that those of us who were around then remember vividly). Quids: as above but a measure of value: you wouldn’t be dead for quids. Quack: the doctor. Not a reflection on his medical qualifications or skills. My dad always referred to his GP as “the quack”. Where shall we travel for R, I wonder? 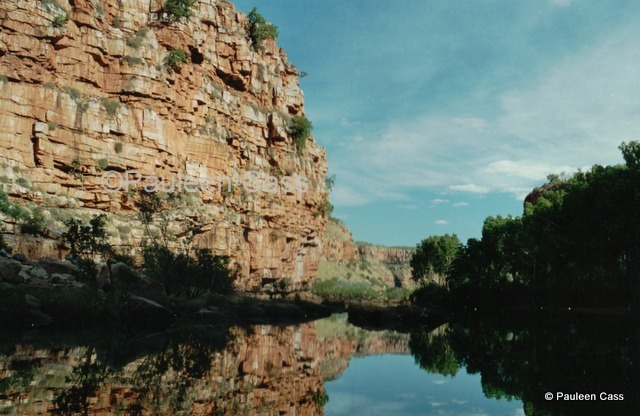 Today’s travel excursion takes us over the Territory’s western border to the Kimberley region of Western Australia and Purnululu National Park, more commonly known as the Bungle Bungles. 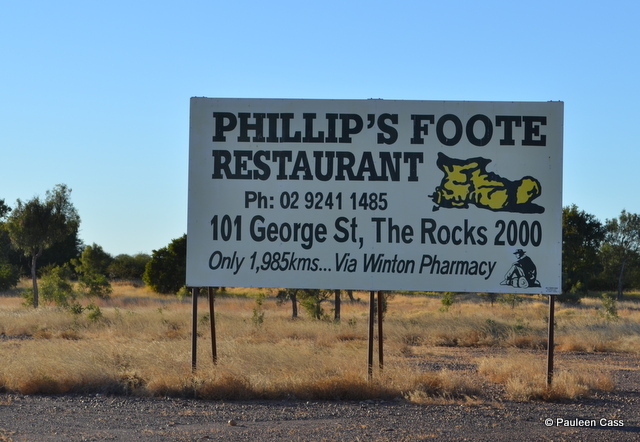 Accessible by a rough 4WD track this site is justifiably famous for its amazing rock formations and wilderness. When my daughter and I drove in some years ago, there were a number of casualties along the road –camper trailers with wrecked axles, cars with flat tyres etc. There is no resort there so you take in your own gear and take out your rubbish. If you don’t have a 4WD this wonderful site is inaccessible and you’re left with a small aircraft or helicopter flight as your only option. We chose to do that as well, making it my one and only helicopter flight, and what a great one it was! I’ll let the photos show you just how spectacular it is. 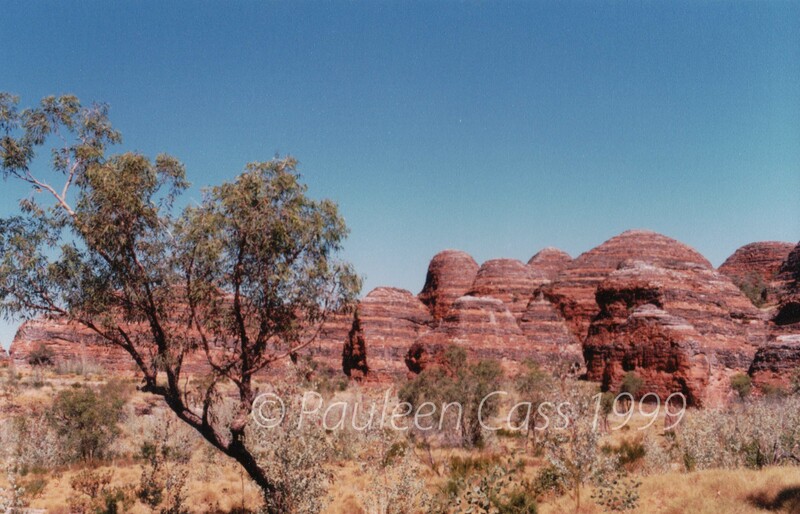 The distinctively striped domes of the Bungle Bungles. 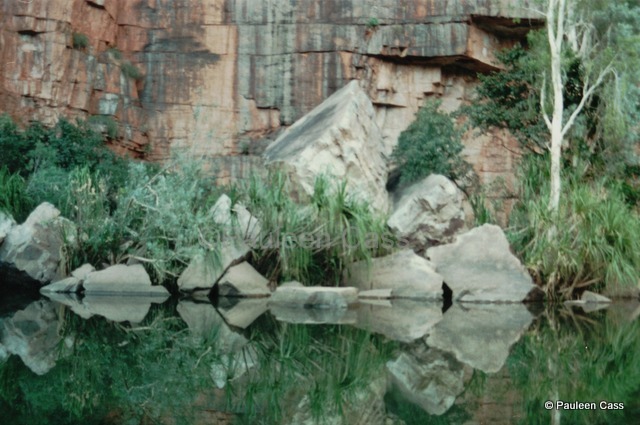 As well as the rock formations there are “hidden” waterholes providing shelter and serenity for the country’s original inhabitants, and its more recent visitors. Seen from the air, the vastness and strangeness of this area is remarkable. Those who have an interest in geology might be interested in a quick read here. It’s worth remembering that despite the relative youth of the nation of Australia, its Indigenous people have been here for over 50,000 years surviving in an often very unforgiving landscape. 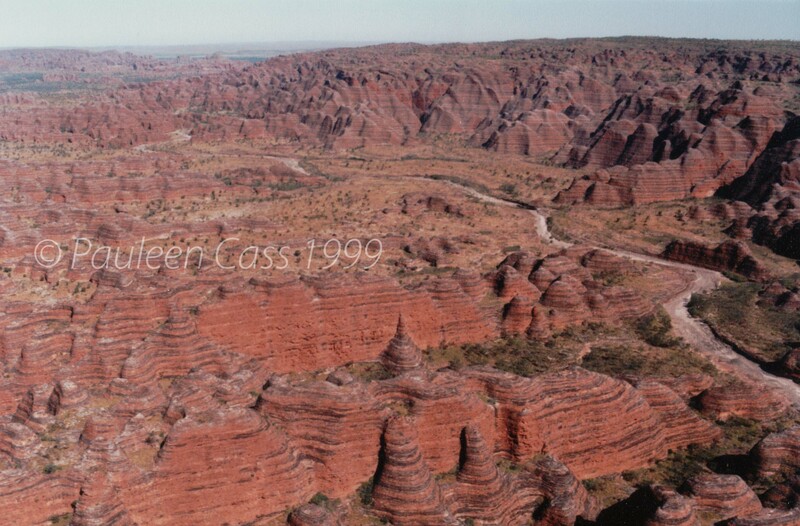 A helicopter flight reveals the hidden canyons, waterways and domes of the national park. 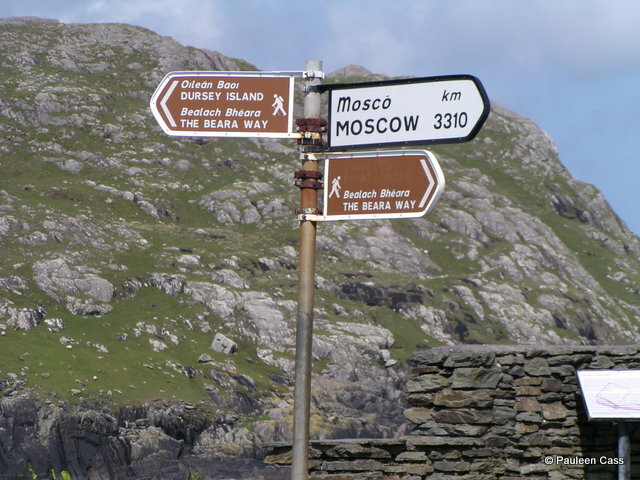 Why Visit: To see a truly unusual natural feature and for a wilderness, rough camping experience. This is a seasonal location and can’t be visited in the summer months (the Wet Season). FYI: There are a couple of maps on my A to Z planning post which will help you to pinpoint where today’s tourist spot is situated. Prawn: don’t be difficult/silly or a pratt eg “don’t come the raw prawn with me”. Pakapoo ticket*: an indecipherable bit of writing. Prang: a car accident (not a major crash) “the kids pranged the car again”. 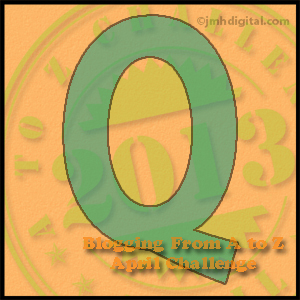 Why not check in tomorrow to see where Q will take us? This water channel gives some idea of the force of the Wet Season’s rains.